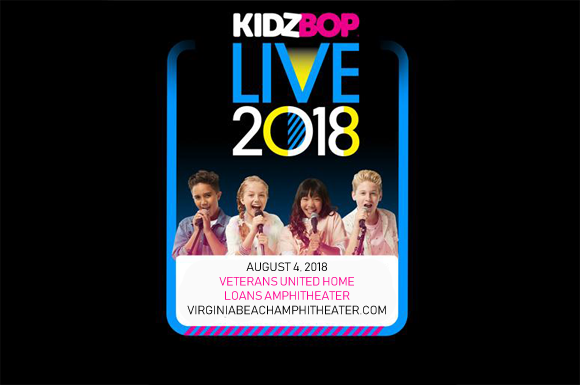 The nation's favorite family-friendly concert series, Kidz Bop Live, will be headed to Veterans United Home Loans Amphitheater on Saturday 4th August 2018! Perfect for your child's very first show, Kidz Bop Kids Ahnya, Cooper, Freddy, Isaiah and Julianna, and BRAND NEW Kidz Bop Kids Olivia, Shane, and Indigo bring all the biggest chart hits to the stage in Kidz Bop's biggest and best show yet! Billboard Magazine's number one kids' artist for eight consecutive years (2010 – 2017), Kidz Bop is a revolution in kid-friendly music, with over 17 million albums sold to date! Taking all the biggest and best radio hits and recreating them to be child-appropriate, Kidz Bop is music “sung by kids, for kids,” so everyone can bop along together! Kidz Bop Kids Ahnya, Cooper, Freddy, Isaiah, Julianna, Olivia, Shane, and Indigo take Kidz Bop on the road this year, so you and your little ones can dance along LIVE – perfect for their very first concert!